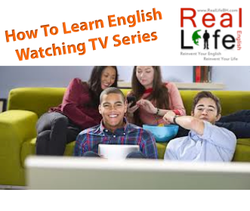 This is my second article for the Real Life English blog and today I’m going to talk about how to improve your English using TV series and movies. Nowadays we have a variety of sources for movies and series, such as Youtube, DVDs, cable and satellite TV, just to name a few. Thinking about this, I even wrote some e-books covering slang and expressions used in American TV series and I’m going to give you some practical tips to make the best use of this tool. 1. Get set with a pen, notebook (or a word editor) and a dictionary. 2. Choose a scene, no longer than five minutes. 3. Watch the scene in English, without subtitles. Try to write down the words and expressions that you understood. 4. Watch this scene in English, without subtitles, again. Write a little paragraph (in English or your mother tongue) about what’s happening. 5. Now watch the scene with the subtitles in your language. Compare the scene script with the words and the paragraph you wrote down. 6. Watch the scene in English, without subtitles, a third time. Try to write down more words and expressions that you understand. You can stop as often as you wish. 7. Now watch the scene with subtitles in English without pausing the vídeo. Try to add more words and expressions to your list. Up to this point, don’t use your dictionary. 8. Watch the scene again with the subtitles in English and pause to add new words and expressions. You don’t need to write full sentences, only new words and expressions that are new to you. 9. After you’ve watched the scene six times in English, try to infer the meaning of the words and expressions you wrote down. If you can’t, use your monolingual dictionary if you’re an intermediate/advanced student, or a bilingual dictionary if you’re a beginner. 10. Remember, whenever possible, write down the new words and expressions within the context. For example, on a Glee episode, I saw the characters use the collocation “brutally honest” many times, so I wrote it down. You will see that in the long run, you will be using your dictionary less and less because this kind of deep practice (listening and reading) will help you improve your awareness towards words and you will start seeing some useful patterns too. Here are some more ways to improve your English using series and movies. Here’s something you can do after you watch a movie or an episode of a series: pretend you are telling someone what happened on the episode or movie. Add as many details as you can – go back, say sentences again, look up for new words you don’t know yet and keep practicing. As with speaking, you can write some paragraphs about what happened on the episode by using the words you’d already written down when you watched the scenes previously. If possible, have someone take a look at your paragraph and give you feedback – either a teacher or a friend with more advanced language skills. You can also try to recreate the dialogues of some scenes with your own words; there’s no need to look exactly like the original. You can also create a whole new dialogue based on the scene you’ve just watched and give it a new ending. Challenge: why not a start a blog on your favorite series in English? I can’t stop saying this: listening and reading will work wonders in your English learning process. The more you read and listen, the more vocabulary you will learn and the more structure (grammar) patterns you will encounter. Not to mention the fact that learning a language also means learning the country’s culture, which is always present in movies and series, and that is a big plus! Remember that learning takes time and learning things thoroughly (like in the 9 steps above) should not be done carelessly. Take your time, enjoy what you’re doing and if you’re tired, stop, take a little walk, have a sip of water, then start studying again. T his is it for today! I hope you like my tips on using series and movies to improve your English. How can I reach Adir Ferreira? This is a guest post written by our friend Adir Ferreira over atwww.adirferreira.com.br. You can also find him on Twitter and Facebook. Great article Adir! I’m going to apply this to other languages I’m learning. 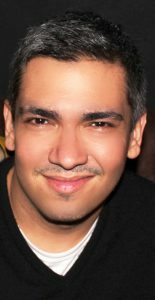 Hi there, I am native English speaker but I study languages at university (namely French and Spanish). I’ll start using these methods for sure to improve my listening skills, as they can be applied to learning any language 🙂 Just a question, what do you recommend to do if the clip you want to watch doesn’t have subtitles? Thanks for the useful blog. Hello Adir Ferreira , I HOPE YOU ARE a happy teacher. Your tips in english are very useful, thank you for all. I am fond of english language and I! ve traveld to USA.Israel, Egypt, Italy Spain and Greece without problem. English is international. Hey, Dillon. If you’re an intermediate/advanced learner subtitles are more of a plus; however, I still used them a lot when I’m watching movies/series with more intricate vocabulary, for example “Game of Thrones”, which has more ancient English. That was great Adir! I'm going to give this to all my students tomorrow! hi friends any one want to chat me in english I am searching someone please send me request on imranali362. This was excellent, and even though I'm a native English speaker, I'll be using this to study other languages. I liked so much this tips. It´s really helps people who interested in learn English. Sorry. I wanted write “who are interested in learn English”. I am learning english . I am from indonesian. I found this article so helps me and your steps that you've given so meaningful to me . I hope i can speak english fluently and naturally. Excelent article, it is very useful for learning vocabulary and new expressions. I have signed up to the Friends course of reallife. I expect learn a lot and enjoy the tv show that I never watch it. Thanks for the enthusiasm and efforts. it was really awesome guide for learning English language, thank you so much. i am a student of master course, i am trying to improve my English communication skill, today i am really happy when i read this guideline. Great idea. Check out NatifyMe flashcard app. It automates learning words from your fav videos! I really like this article as well as the author’s recommendation since American slang or British words can be learnt by watching TV series several times.Thanks a lot for writing this article.I really enjoy the video. You tv series are very helpful to understand of english and cultural of american. All the lesson from your series are what we can’t learn from school and text book.